Performance Time: Approximately 45-60 mins, 55 pgs. CLASSIC/COMEDY. Adapted from the fairytale by Madame d’Aulnoy. Felicia and her brother Bruno are penniless and have just two beans and one egg left to eat. Bruno wants to sell Felicia’s two prized possessions, a silver ring and a pot of pink flowers, to buy food. But Felicia refuses because she promised her dying father that she would always water the flowers and never part with her ring. When Felicia ventures into the woods to get water for her flowers, she meets the Queen of the Woods, who gives Felicia some food. Grateful for the food, Felicia insists on giving the Queen her silver ring. Suddenly, Felicia’s water pitcher magically turns to gold. 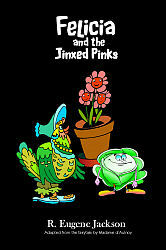 When Felicia returns home, she discovers that Bruno has stolen her pot of flowers and replaced it with a cabbage. But it turns out that this cabbage isn’t an ordinary cabbage…it can talk! And so can the hen! Audiences will love this delightful, charming play.